(1). Beds, baths and changing mats for babies, subject to availability. In the Opera neighborhood. 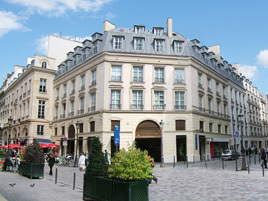 With it's elegant 18th century style façade, the residence is located in the same area as the Parisian department stores, the Garnier opera house, the Madeleine church, and just a step away from the theaters and the Grands Boulevards. Right in the heart of Paris, come explore one of the liveliest areas of the city, where culture and business meet. You can quickly get to the place de l'Opéra square with its majestic buildings and its very busy business district where the headquarters of many famous companies are located. Shopoholics will be overjoyed strolling around the big department stores or luxury boutiques. Open 24 hours a day 7 days a week. The residence offers the highest level of comfort with top of the line service for its 90 air-conditioned apartments, ranging from studios to 2-bedroom duplexes. The residence is characterized by modern design, beautifully made fabrics, light wood floors, and high quality household appliances. Note that the residence has two apartments reserved for people with reduced mobility.